BOULDER, CO--(Marketwired - February 25, 2015) - SolidFire, ranked the #1 Solid-State Array, continues to disrupt the flash market with the latest addition to its SF Series product line -- the SF9605 -- and announces its FlashForward Program, the storage industry's smartest guarantee. Introduced today, the SF9605 delivers 34.5TB effective capacity and 50,000 predictable IOPS, continuing SolidFire's track record of driving down the cost of all-flash arrays by providing the highest density and lowest cost in the SolidFire portfolio. 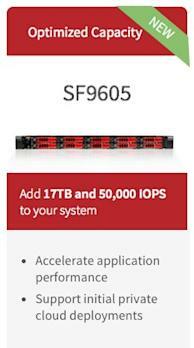 The SF9605 is the latest addition to the product line and delivers the full award-winning SolidFire feature set, including Guaranteed Quality of Service (QoS), in-line data reduction, and complete system automation, all in a format that meets the needs of customers where scale out capacity is a primary requirement. SolidFire also announced today the FlashForward program, which incorporates two key guarantees: a Platform Compatibility Guarantee and an Unlimited Wear Guarantee, both designed to deliver unparalleled investment protection and peace of mind for current and future customers. The Platform Compatibility Guarantee protects customers' investment in SolidFire systems by guaranteeing both software and hardware compatibility for all systems under a support contract. This allows customers to obtain new software functionality free of charge for the life of the system, rather than requiring controller upgrades for major software updates as is common in the industry today. Furthermore, hardware compatibility ensures that customers can mix new SolidFire nodes with their existing system, allowing them to expand with the latest flash technology as their system grows, rather than being locked into a single generation of flash. The Platform Compatibility Guarantee eliminates the hardware replacement, storage migration, and forklift upgrades that are common with traditional enterprise storage systems. Additionally, SolidFire's Unlimited Drive Wear Guarantee further protects customers by eliminating concerns around flash endurance. Drives within every SolidFire platform are guaranteed against wear without use-case or workload restriction for any system under an active support contract. With the FlashForward Program, customers can be confident that the SolidFire storage platform will continuously support their business as IT infrastructure needs evolve. "For SolidFire customers, the idea of repurchasing, re-configuring and/or upgrading your storage infrastructure and controllers every 3 years is an antiquated concept. Our customers see their next generation data centers in a very different light," commented SolidFire Founder and CEO, Dave Wright. "SolidFire customers expect their storage infrastructure to have the ability to keep pace not only with their changing business, but with changing flash technology as well as providing long-term investment protection. The idea of installing a rigid storage system only to watch it age and become obsolete faster than you expect is not something we, or our customers, believe in." Recently ranked the #1 Solid-State Array by independent analysts, SolidFire offers the highest-performing all-flash storage systems for both accelerating application performance and consolidating mixed workloads. The SF9605 is currently available for order through SolidFire and its global partner network. To learn how to put SolidFire's scale-out all-flash storage platform to work in your data center, visit www.solidfire.com/flashforward.